I'm so excited because this week holds one of the best online sales of the year - the Shopbop Friends and Family Sale with 25% off site-wide (some brands excluded) when you use the code SPRING25! This is the perfect time to invest in some nicer brands and items you've been eyeing, and I'm planning to pick up another pair of Ray-Ban aviators (I'm thinking the all-black) and maybe a white or blush Rebecca Minkoff bag for spring/summer. 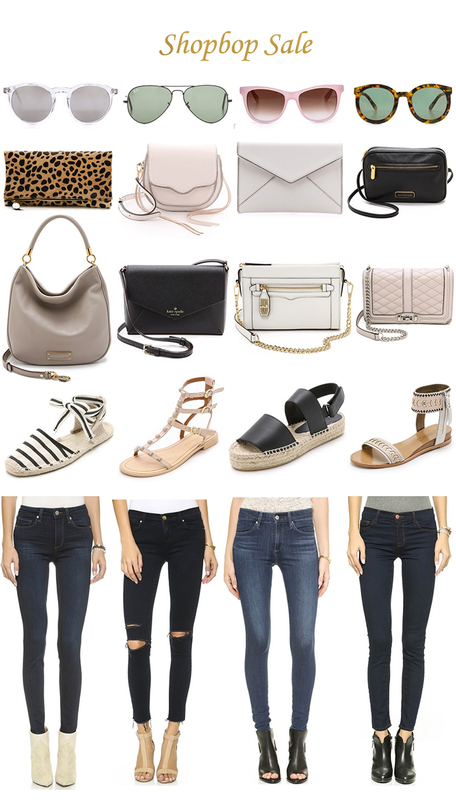 Some of my recommendations of what to buy during a sale like this are nicer denim brands like J Brand and Paige jeans, bags from some of my favorite designers like Rebecca Minkoff, Marc by Marc Jacobs or Kate Spade, and of course shoes and then sunnies like Ray-Bans or Karen Walkers! Let me know what you're picking up from the sale!! I LOVE my all black raybans! And I just ordered a white Rebecca minkoff mini mac! I can't wait to get it!